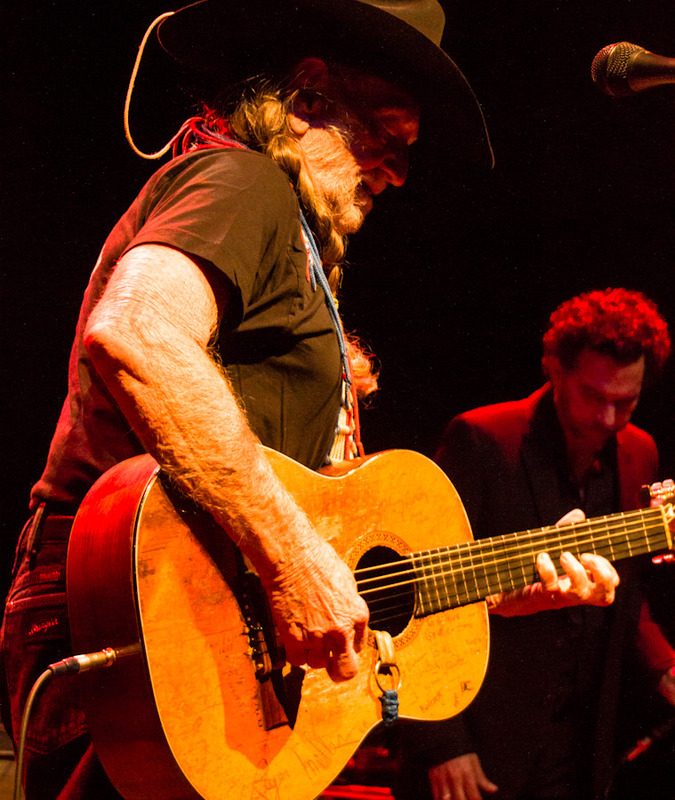 Willie Nelson doesn’t need an introduction. Just the mention of the name conjures up images of cowboys, whiskey, red headed strangers and yes, the pot. To say the man is a living legend would be a gross understatement. Nelson is a burning star in a world where many of those lights are going dim. He’s one of the few people left who you can point to and say “That man, right there. 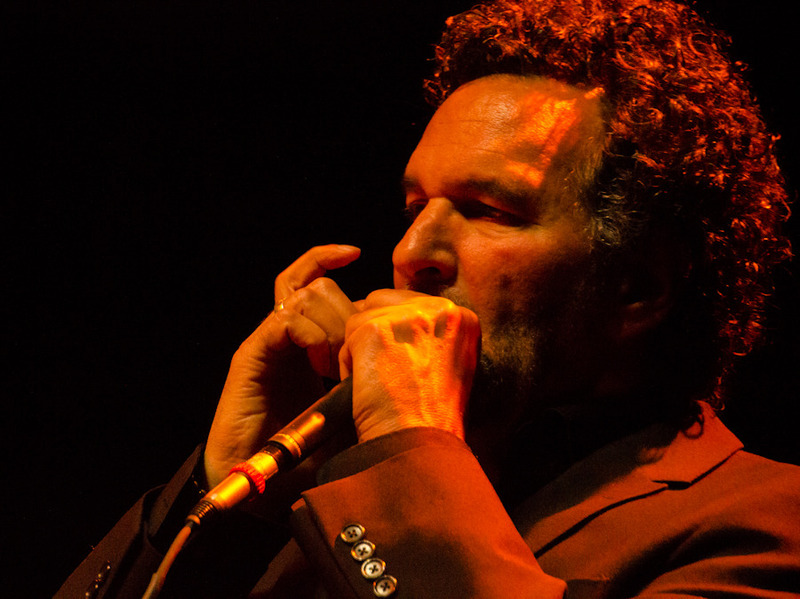 HE is one of the reasons modern music is what it is today.” There are heavyweights in the music world and then there are the collusi: Dylan, Cash, Bowie, Wonder, Springsteen, Charles, Jones, Davis, Presley, McCartney, Lennon – the list goes on but not for too much longer. 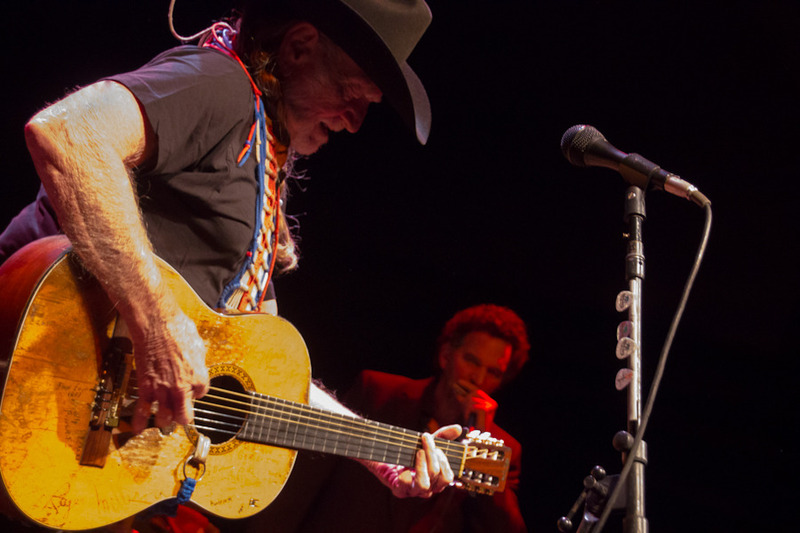 These were the rebels, the trailblazers, the outlaws, and no such list could possibly be complete without Willie Nelson’s naming sitting right up there near the top. 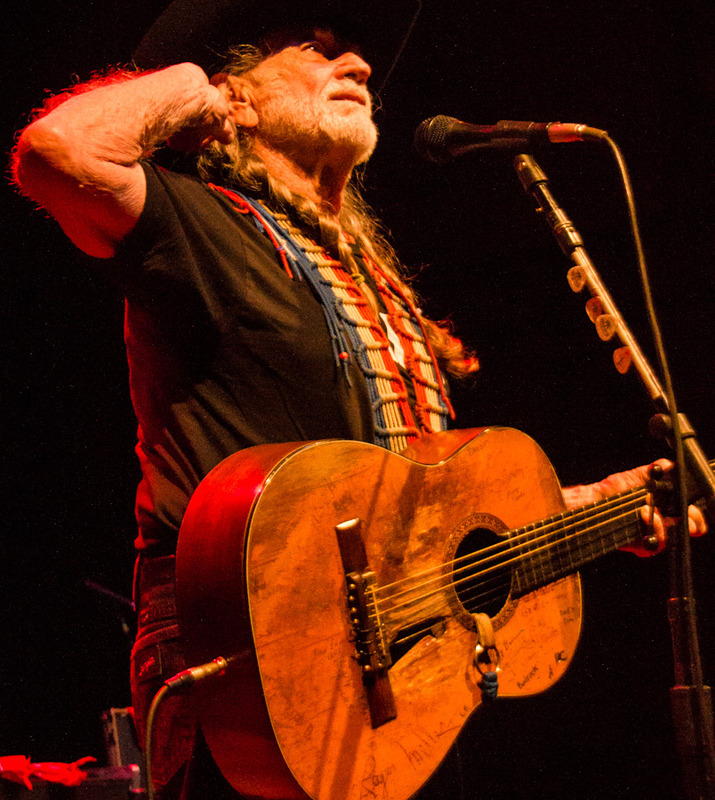 Look up legend in the dictionary....At the 9:30 Club Monday night, Willie Nelson brought his legend to bear in full as he took the stage wearing a ratty pair of jeans and trademark cowboy hat. With reddish gray braids shooting out from underneath the brim like a pair of wild branches, Nelson hit the ground running with a float down “Whiskey River” and didn’t let up for a solid 90 minutes. 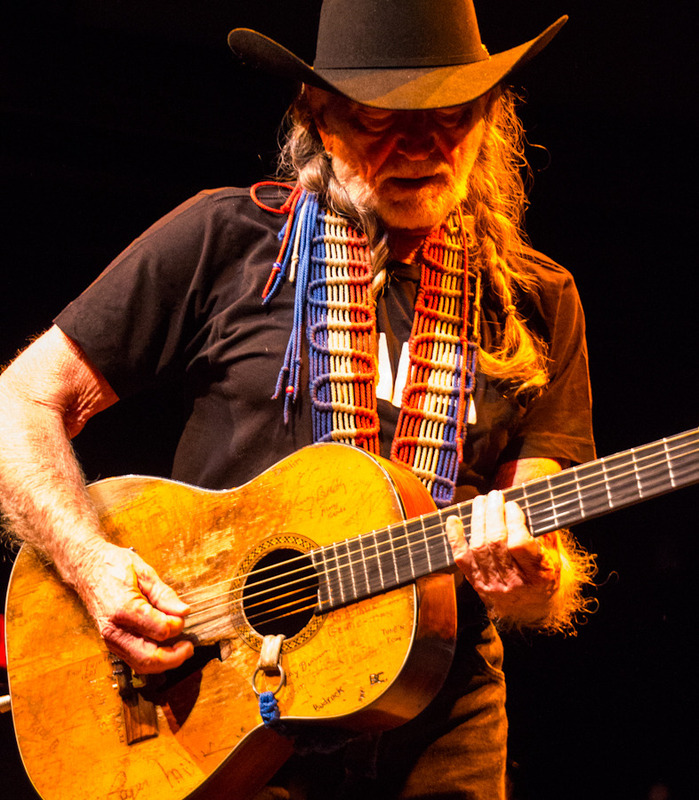 At 79 years of age, it would be fair to expect some diminishment of the septuagenarian’s abilities, but as if some sort of challenge to the idea of time itself, Willie and has band played like a band on fire. More specifically, the played like a group of musicians who has been doing this for damn near 60 years. As the night went on it became apparent that the question wasn’t to be “Do you think you’ll hear song ‘x’?” but “How can they possibly fit all of their hits into one show?” Consider this: songs like “Angel Flying Too Close To The Ground”, “Blue Eye’s Crying In The Rain”, “Good Hearted Woman”, “On The Road Again” – I’ll stop, but you get the picture – these songs aren’t just classic, they’re timeless. They are as much apart of the American fabric as apple pie, baseball, blue jeans and reality television. When you talk about the Great American Songbook, this is pretty much it. When standing face to face with a living legend it’s hard to keep from swooning and even harder keeping your jaw up off of the floor. 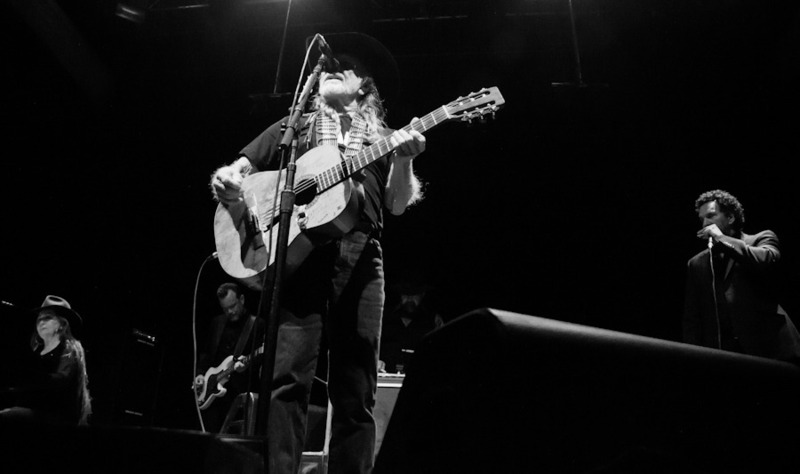 In talking about it, one could drive deep down into the minutiae, attempt to break down the differences between Willie’s playing, singing or whatever now and 15-20 years ago (Or 30…or 40), but it would be an exercise in futility. The same guy that implored Mamas to steer their children as far away from a gaucho lifestyle as possible (and yes, the song was played) urged the crowd at the 9:30 Club to “Roll me up and smoke me when I die.” It’s a hilariously self referential verse that simultaneously speaks to Nelson’s association with, and love of, the pot, yet also to a more universal expression of oneness. Its sentiment was soulful, witty and intelligent and a perfect example of why Nelson has endured for so long: His soul. 100% older and 100% more badass than you. Not usually one to wax spiritual, it has to be said that the most important thing I can take away from this spectacular evening is that Nelson was simply born to do this. Not to beat a metaphor into the ground but some people ARE Doctors. Some people ARE Lawyers. But some people are troubadours. Some people are poets. Some people are even COWBOYS. It’s those people that flesh out our humanity, moving beyond being mere entertainers to a place where they are beacons of some deep seeded human truth. And as they slip from this world at a seemingly ever increasing pace (RIP Levon, Adam, Chuck, Duck and Diana) it’s important that we not only recognize their contributions to this world, but celebrate them. Put in those terms Nelson’s performance was like hanging out with an old friend who is more than eager to share his years of acquired wisdom. I shudder to think that this is any sort of victory lap for the singer. He just keeps getting better with age, and even though I know that point will come, I see no indication that it will be anytime soon. But if it turns out that we are in fact nearing the end of the long and dusty highway for this legendary singer/songwriter/musician, then I can at least be glad that I finally got to witness his talents first hand. More appropriately though I’m happy to say that after fifteen damn years of trying, I finally saw the light, because you know what…he played that song too. Catch a contact high and check out the rest of our shots from the show.